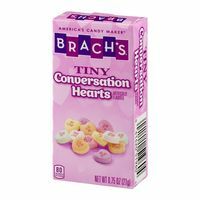 Brachs conversation hearts are a perfect way to say I love you. Tiny candy hearts in pastel colors with sayings of love imprinted on them. Kids love getting these candy hearts for their valentine exchange. They can't wait to open the box and pour all the hearts on the desk and see what they say.